Monday, Monday, can’t trust that day. The invitation plunged me into a quandary because Roderick’s obituary had been posted at our high school website. He could not be dead and getting married, unless I was underestimating one of the brightest bulbs of our bygone days. In our sheltered youth, he had been obsessed by band (marching, symphonic, concert, stage), orchestra (symphony and concert) and two clubs, Concert Choir and Modern Music Masters, until, subject to the iron laws of hormones, he had veered pathologically toward heavy metal. As a boy, I would have accused a disciple of Deep Purple before anyone else of posting a fake obit. I inspected the envelope. The postmark indicated the prodigal who had sworn to seek adventure if he had to burn every bridge in his path to do so resided in the very ‘burb where he and I were raised. What had become of his soaring ambition? The next mystery was Linden Hall, a late Gilded Age mansion located in a quiet corner of our native southwestern Pennsylvania, owned by the United Steelworkers of America. The area was too quiet for most people, especially in inhospitable January. A footnote on the invite even disclosed that the newlyweds would spend their honeymoon there. Treacherous road conditions between Pittsburgh airport and my destination treated me to near-death experiences as I struggled to unlock the code of the driving directions on the wedding invitation, printed in irritating Gothic script on black imitation vellum. A storm was at full throttle. For old time’s sake, I tuned the rental car’s radio to an AM station. The national weather service was dubbing the storm “Madeline,” an odd coincidence. Outside my window, spindly branches waving precariously from leafless trees cautioned me against approaching a dark tunnel. A low bridge over the frigid Youghiogheny River managed to induce acrophobia. The radio’s reception became spotty, voices fading in and out, as if decades of static were interfering with the present. At a railroad crossing, a freight train almost slammed me to kingdom come. Upon reaching the estate gates, I breathed a tentative sigh of relief. My mind was uneasy, but I was thankful to have my body in one piece. To calm down, I glanced over the Hall’s brochure, which had accompanied the invite, while the showpiece itself, dominating a small hill, beckoned: four floors, 35 rooms, 27 fireplaces, 13 bath/powder rooms sealed in dagger-like icicles. The shadow cast by the Hall directed my attention to the parking lot, which was filled with slush and ice instead of cars. Where were the other guests? Where was Roderick’s car? Madeline’s? There was no evidence of tire tracks. I had RSVP’d that I would not be bringing a guest, therefore my hosts knew I would be alone. The air bit like a sadistic nurse’s needle. The struggle to maintain my balance on the slippery path leading up to the Hall distracted me from becoming alarmed by snowfall building a 785-acre white maze around me. Not finding a soul at the front desk, I wandered the silent house in search of the happy couple. Roderick was in the Great Hall, alone. His parapraxes caused me to swallow a petite tremor before filing away the slips for eventual analysis. Despite the passing of time, Roderick looked remarkably preserved. He was, as ever, dressed in black like a rocker – like a mortician – like a groom. I would have imparted the ironies of his apparel to Roderick, but he had already launched into a discourse on classmates who had pre-deceased us. The number claimed by disease or who had taken their own lives practically defied belief, but Roderick defended his statistics passionately. Once I had judged that a change of topic was prudent, I popped the question. Was Roderick bullshitting me? Madeline had been the girl next door, the epitome of a regular gal. She would not have been voted Girl Mostly Likely to Marry Roderick. As if on cue, a cacophony arose from the Hall’s bowling alley. A pool cue cracked against billiard balls. Roderick strode to red floor-to-ceiling drapes and pulled a golden velvet cord with solemn fanfare, revealing an Aeolian pipe organ. 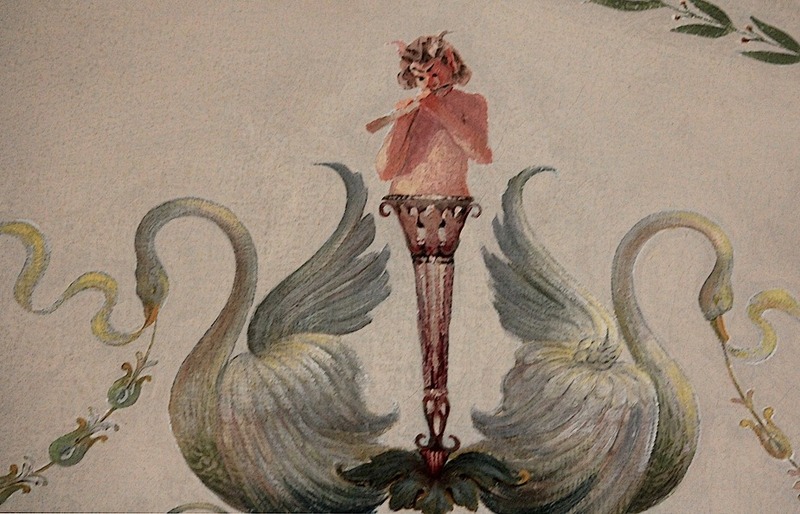 Smiling hard at the musical edifice, Roderick proceeded to whisper as an aside the intimate detail that Madeline had selected the Hall’s white-tiled basement as her boudoir. Having betrayed unconcernedly the couple’s fetish for an atmosphere usually encountered in mental institutions and morgues, Roderick moved to the Tiffany windows. Neither Tiffany nor the full moon could beautify the dreary prospect. A bell jar of gray clouds smothered any spark of high spirits I might have been feeling. 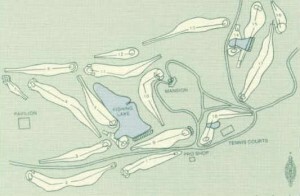 Effaced by winter, the present features of the golf course made me think of a cemetery. Every small indentation in the mournful landscape was a tombstone with a white cap – every fairway some poor soul’s scenic view for eternity. The scale and scope of his exertions were plain to see. He had not dedicated himself exclusively to course maintenance. On closer inspection, one could detect writing in the snow. On holes Ten and Eleven, the closest ones, drifts formed the words “COMPETITION” and “PRODUCTIVITY” and “WAGES.” Indeed he had constructed scare quotes around them. A helicopter or small plane would have been needed to decipher the full text of his message writ large across the entire course. “Is that a mining operation?” I asked, pointing to a ramshackle shack on the other side of the Tenth fairway. We entered the Devil’s Room, where the men used to smoke in the bad old days. 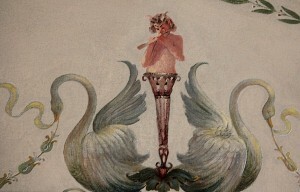 Naked devils partied on the wallpaper behind Roderick. One furnishing, however, did not match the decor: Cardboard boxes containing files towered over us like stacked coffins. Old copies of the McKeesport Daily News, Business Week, Steel Labor, Wall Street Journal yellowed visibly under his care-worn fingers. Here, Roderick escorted me to a majestic aluminum stand, where an open, dog-eared tome greeted me: And the Wolf Finally Came: The Decline of the American Steel Industry by John Hoerr. Almost expecting Roderick to pull a gun from one of the display cases around us, I gasped at the sudden appearance of pain on his face. I gasped again when he turned on me with an electric guitar, wearing the deranged expression of his garage band days. “The Fearfuls are alive and kicking!” he crowed, pointing to a makeshift stage bristling with polyphonic synthesizers, amplifiers – the works. (The Fearfuls were a group of mates led by Roderick who broke up long ago.) Nearby were additional inexplicable devices resembling experiments in the practice of torture. “Good night,” I replied without conviction. As we left the Devil’s Room, Roderick plucked a guitar string that sounded a painfully discordant note. And the volume! It lifted me straight out of my loafers! Was he issuing a warning, being playful, doing a sound check? The response to his invitation, according to Roderick, had been most gratifying. My fellow guests, he had assured me, were present but exceptionally withdrawn, resting in advance of the festivities. Roderick was not being entirely truthful, for in reality the place had the appearance of emptiness and of having been commandeered for his purposes. “The help,” as staff was called in the Hall’s seigneurial period (it was built in 1913 on profits from coke and coal) was gone without a trace. Moreover Roderick, his head elsewhere, had failed to assign a bedroom to me, so I had to root out a skeletal cot in a cob-webbed cellar and bivouac in the Greenhouse Room, where direct access to the outside (and sun!) would be a lifesaver in an emergency. In the dead of night, however, it felt like the bottom of a well. Sweet dreams were unlikely to be in my immediate future as, cursing myself for forgetting to ask Roderick about his obit, I closed my eyes. My troubled slumber was rudely interrupted by nightmarish noise. The source? Madeline on the organ in the Great Hall, Roderick on electric guitar in the Devil’s Room, combining their talents. I did not flatter myself that they were serenading me. No, it was a personal statement, a love song. The walls separating them were as nothing. The show opened with raw feedback, which evoked for me – as it would for anyone who grew up in the vicinity of steelmaking – iron ore, coke, and lime being dumped into a blast furnace and coming to a 3,000 °F boil. I prayed the musicians were wearing asbestos suits. The next sequence was akin to the tapping of a furnace guiding molten iron into a railroad car. This astonished listener expected the Hall to crumble in the din. But there was no time for crying over spilt iron because a riff like the screech or whine of a locomotive transporting molten metal to the steel shop, where the payload is poured into another gargantuan furnace, assaulted my ears. I could picture oxygen-furnace operators adding scrap steel and fluxes, rolling the mixture around for about 45 minutes at 2,800 °F and pouring the contents into a ladle dangling from a crane hook. With not inconsiderable alarm, my brain registered a monstrous crane’s movement, sirens screaming, across a wide expanse of shop floor and its discharge of steel into a continuous caster, a channel hundreds of feet long and shaped like the sliding board on a kindergarten playground. Somehow Roderick’s guitar communicated the creep down the channel of hardening steel before it emerges as a slab, bar or bloom. Truly, Madeline and Roderick were punishing Linden Hall, trading solos that compromised its structural integrity. While they covered the spectrum of 60s, 70s and early 80s rock, I recalled young Roderick’s quasi-religious pilgrimages to Pittsburgh’s exanimate Civic Arena, Three Rivers Stadium and Stanley Theater, where he absorbed Blue Oyster Cult, The Kinks and The Grateful Dead – not hockey, football or Phantom of the Opera. Like everybody else nowadays, the boisterous pair must have had cameras rolling in order to preserve themselves for posterity. Until their wedding video is released, the world will have to trust my account of their activities behind closed doors. Insofar as my faculties could be persuaded to grasp their compositions, I bore witness to Roderick and Madeline’s show(wo)manship, their versatility at imitating a factory without a caster, their methodical layering of sonic structures and their pouring forth of emotions. Although Madeline’s touch was about as light as the freight train that had missed me by a hair some hours ago, her heavy hand conveyed unmistakably that she seconded her partner’s dim opinion of the business model of the steel industry as characterized by Hoerr. With a plangent snap, Roderick’s guitar crackled like an ingot throwing off scalding chips as it moves into the jaws of a primary mill. Manipulating levers on the body of his instrument, dancing upon foot pedals, he ran a hand up and down the guitar’s neck, compressing notes, elongating them, shearing them off at the end. The bride had her own panoply of refinements: reheating, rolling, piercing, extruding, welding, galvanizing as the mood took her. The jam session went on and on, without intermission, as if the duo were persevering until they injured themselves or their constitutions gave out. Their equipment too must have reached the point of overheating. This was their idea of to have and to hold! I sniffed for lawfully sourced marijuana and searched corners for empty bottles of Jack Daniels. My investigations yielded nothing: Evidently their minds were not impaired. My knocks on their respective studios elicited no responses: They had locked themselves inside. If and when they emerged, they might explain themselves. Though untrained as a critic and disoriented inside the maelstrom, I hypothesized that they were performing a requiem for steelworkers, miners and their families – the product of Roderick’s anger over the book. Although inclined to flee the Hall’s confines, I knew etiquette required me to offer Madeline my congratulations. After a last knock for the sake of politeness, I broke down the door of the Great Room to find – no Madeline! Roderick’s “Madeline” was a software program, or whatever it is the music/technology cognoscenti call it. She was a stand-in, a surrogate. “Her” dirges were emanating from machines, a fiendishly conceived feedback system connected to the Improviser in the Devil’s Room! In my distraction, I stumbled from the Hall to the golf course, which should have served as a familiar, consoling bosom. Instead, at this perilous moment, the memory of an online search erupted from the core of my brain. The deceptively placid surfaces of the fishing lake and golf course hid, I had learned, the fact that Linden Hall and its environs were threatened by land subsidence. Decades of bituminous coal mining had destabilized the very foundation of the Hall’s foundations. Chewing on this factoid and nearly perished by the nippy weather and mesmerized by the aural tour de force, I knew I had to answer the existential question posed by The Clash on their 1982 album Combat Rock: Should I stay or should I go? Roderick’s “fishing hut,” perched as it was on slowly cracking ice, was no place to seek refuge, so at a safe distance (the Eleventh green) I watched the Hall defend itself against the power chords of Roderick and “Madeline.” Their security deposit would not cover the repercussions. The spoiled child of Mrs. Cochran (the coal and coke baron’s widow), whose reflection trembled across the lake, threatened to succumb. Leaning for support on the flagstick, whose pennant resembled a frozen face of reproach, I waited for Linden Hall to sink ignominiously into a subterranean arm of the lake and sleep with the catfish and trout alleged to prowl its pitiless depths. Simultaneously, Roderick – without me his own best man – continued to insist loudly that I rejoin the party.